This event is brought to you by: League of Women Voters, Sustainable Connections, and Re Sources for Sustainable Communities. Join a communtiy discussion about Whatcom County water solutions. Find out what green solutions Philadelphia, Portland, San Antonio and The Bronx are using to address their problems with water pollution, storm water run-off, and water scarcity. 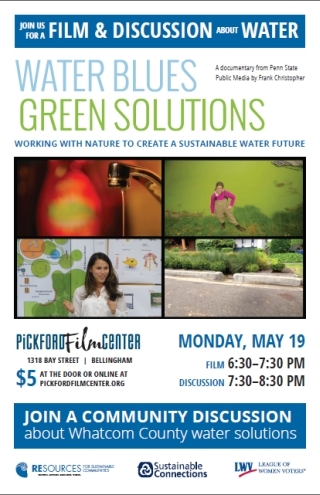 Local panelists will discuss the film, how these concepts can be applied in Whatcom County, and how you can make a difference.